What a weird week last week was. Weird and scary…and not just because of wacky Halloween costumes. We count ourselves very lucky at our house, and if you live on the East coast, I hope the same is true at yours. Some minor disruptions and inconveniences were all that Sandy really dealt us and our neighborhood. Still, it was nice to have something comforting to bake after just emerging from the supposed storm of the century. Like the name says, Marion Cunningham’s Buttermilk Crumb Muffins are made with buttermilk and have a little crumb on top. They also have some warm spices and brown sugar. They were tasty, simple and homey. Nothing that will knock your socks off, but we ate them all just a few minutes out of the oven. Maybe you don’t always need your socks knocked off at breakfast anyway, right? The original recipe makes sixteen muffins and uses all shortening as the fat. When I said we ate them all, I should clarify (so you don’t think my husband and I are complete pigs) that I made one-quarter recipe for just four muffins, using 2 tablespoons of butter and one whole egg. I went a little heavy on the spices and a little scant on the sugar. For the recipe, see Baking with Julia by Dorie Greenspan or read easier than pie (it’s also here). And there’s even a video of Julia and Marion making these together. Don’t forget to check out the rest of the TWD Blogroll! Your muffins look very great!! Yummy! I love the photos of your blog, they are really nice!!!! Great pic of your muffins. i too enjoyed the muffins straight out of the oven….not so great the next day. Lovely pics. Your muffins look perfect. 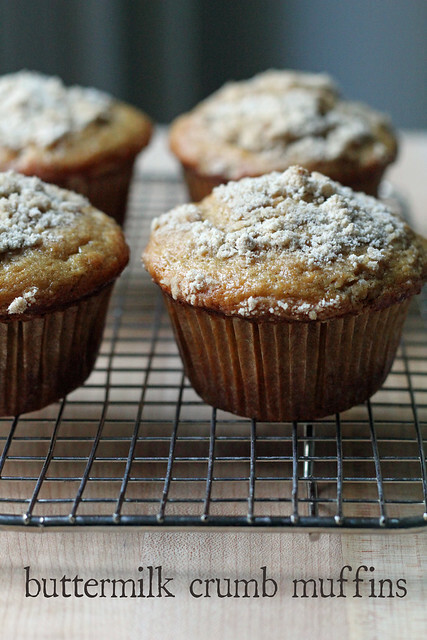 The muffins look lovely – they are quite homey indeed. Glad to hear that you are doing ok after Sandy! agree.. they were good and moist.. but a bit boring.. wont be making them again!! Great shot of your muffins…I anticipate that you are near the east coast. Glad you are ok from storm SANDY. Fortunately, I made these muffins long before they were scheduled and the post was done weeks earlier. These muffins looks very delicious. Thanks for sharing the links to the recipes. I went heavier on the spices as well. Your muffins do look lovely. Glad Sandy did not affect you too much. Lovely muffins. I may have liked these more if I went heavy on the spices; mine turned out rather bland. Sounds like the perfect simple and comforting breakfast needed after the storm. Glad too hear you are safe and sound! I agree, simple and homey can be very comforting at times. Especially when everything else feels a bit chaotic.